Ubisoft is making the free-to-play Ghost Recon Online instead of a PC version of Future Solider because 95 percent of you are just going to pirate the game anyway. Here's what I think is happening. I think that Ubisoft doesn't have the stones to break up with you, so instead it's acting like a jerk to try to make you break up with it. How else could you possibly explain its behavior over the past couple of days? Yesterday the creative director on I Am Alive dismissed "bitching" about the apparently-not-gonna-happen PC edition of the game as just noise and said the platform isn't worth developing for, and today it's Ghost Recon producer Sebastien Arnoult effectively stating that if you're a PC gamer, then you're a pirate. Ghost Recon: Future Soldier is slated for a March 2012 release for the PlayStation 3 and Xbox 360, but the PC is getting the free-to-play Ghost Recon Online instead. "We are giving away most of the content for free because there's no barrier to entry," Arnoult told PCGamer. "To the users that are traditionally playing the game by getting it through Pirate Bay, we said, 'Okay, go ahead guys. This is what you're asking for. We've listened to you - we're giving you this experience. It's easy to download, there's no DRM that will pollute your experience.'" "We're adapting the offer to the PC market. I don't like to compare PC and Xbox boxed products because they have a model on that platform that is clearly meant to be €60's worth of super-Hollywood content," he continued. 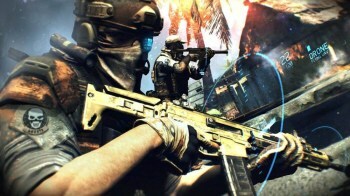 "When we started Ghost Recon Online we were thinking about Ghost Recon: Future Solider; having something ported in the classical way without any deep development, because we know that 95 percent of our consumers will pirate the game. So we said okay, we have to change our mind." I'm not sure what to say about this. Ubisoft apparently believes that 95 percent of its PC audience - which is perilously close to all of it - gets their games via illegal downloads. The number-one digital distributor is not Steam after all, but The Pirate Bay. And because of that, "deep development" is out and churning out giveaway crap is in. And "we've listened to you?" I suspect not, actually, but at least now we know where we stand. Thanks for that, guys.